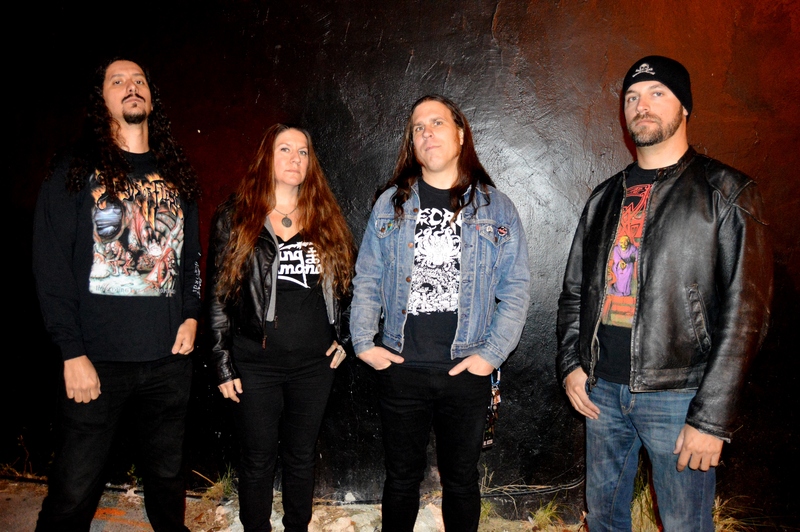 The latest in a line of bands imitating the sound of yore, Gruesome is a California and Florida-based worship act to formative death metal outfit Death, and its pre-“Human” era, specifically the duo of “Scream Bloody Gore” and “Leprosy”. 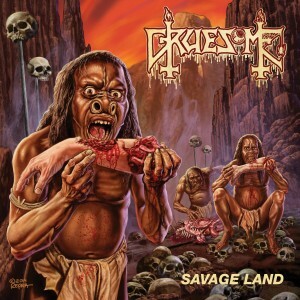 Gruesome consists of stalwarts Matt Harvey (Exhumed), Robin Mazen (ex-Demonomacy, Dérketa, Castrator), Gus Rios (ex-Malevolent Creation) and Daniel Gonzalez (Possessed). Harvey and Rios were involved in an earlier incarnaton of Death To All, a revolving group of Death alumni celebrating the repertoire and legacy of the late Chuck Schuldiner and Death. Matt Harvey’s affinity for cloning better known bands is widely documented through out his body of work with reputable Carcass clone act Exhumed, and his two retro-thrash metal revival acts Dekapitator and the masked Ghoul. Likewise its clear that Harvey is an avid fan of the early Schuldiner repertoie as he recreates the chord progressions, riff schematics, tonal nuances, melodic sensibility and overall writing dynamics nearly perfectly. It is good to see bass guitarist Robin Mazen return within a more visible act. Harvey imitates Chuck Schuldiner’s vocal cadences to its smallest details. Mazen’s bass guitar tone perfectly replicates Terry Butler’s chunky tone on “Leprosy” and “Spiritual Healing”. Further cues to the seminal Death can be found in the band logo (especially the spider decoration and inverted crosses) and the album title font. It also helps that the album is openly dedicated to the late Chuck Schuldiner himself in the production notes. The opening track is a nod to ‘Leprosy’, ‘Trapped in Hell’ is ‘Defensive Personalities’, ‘Psychic Twin’ is ‘Living Monstrosity’, ‘Closed Casket’ obviously is a tribute to ‘Open Casket’, ‘Demonized’ is ‘Altering the Future’, ‘Hideous’ has the main riff from ‘Leprosy’. ‘Gruesome’ nods to ‘Infernal Death’ and ‘Born Dead’ the “Leprosy” album. The lyrics are structured in the same way as the pre-“Human” era writings of the late Schuldiner, applying similar rhyme schemes and choice of vocabulary. Lyrically the album is akin to “Scream Bloody Gore” as it for the most par draws from 1970-80s horror movies. ‘Savage Land’ is heavily inspired by Italian cannibal movies such as “Man From Deep River” and “Cannibal Holocaust”. ‘Trapped In Hell’ is about the “Hellraiser II: Hellbound”. ‘Demonized’ is the sort of satanic gore song that was prevalent on “Scream Bloody Gore” while being lyrically reminiscent of ‘Sacrificial’. ‘Hideous’ is a callback to ‘Living Monstrosity’. The deluxe CD version includes an additional two tracks with true to form covers from Slayer (‘Black Magic’) and Death (‘Land Of No Return’). The Slayer cover is especially well-chosen as it dates back to an old 1984 Death/Mantas rehearsal. The album features a guest guitar solo on ‘Closed Casket’ by former Death axeman James Murphy (who also substituted for an unavailable Obituary guitarist Allen West on “Cause Of Death”), a guest guitar solo by Fred DeLillo (Rick Rozz) should be reserved for the provisional second album. The appearance of Murphy sets an interesting precedent for other Death luminaries to guest on future Gruesome recordings. The door is now wide open for Paul Masvidal, Andy LaRocque, Bobby Koelble, and Shannon Hamm to guest on future output; The subdued and docile bass playing fits with the early direction that the record pays loving tribute to, but imagine what bass specialist Steve DiGiorgio could bring to this band with an extended guest appearance. Likewise it will be fascinating to see where Gruesome will go from here, and whether they will persevere with the “Leprosy” sound, or explore Death’s later more technical era on future releases. "Savage Land" was recorded at Riversound Studios in Fort Lauderdale, Florida with Rios and Gonzalez producing. The album was mixed by Eulogy mainman Jarrett Pritchard at Mana Studios in St. Petersburg, Florida. The earthen, bassy production replicates the low end thickness and crunchy guitar tone of “Leprosy”, and “Spiritual Healing”. The duo must have diligently spent countless hours recreating the late 80s/early 90s Morrisound production in minute detail. Similarly is the cover artwork by legendary illustrator Ed Repka (Atheist, Death, Massacre) is a thematical recreation of the “Leprosy” cover. Instead of functioning as a warning of chemical warfare and nuclear armageddon as did the original piece “Savage Land” blocks the same scene within a remote cannibal context. The artwork is meta in a sense that it recreates the iconic “Leprosy” artwork while simultaneously being attentive and perceptive enough to acknowledge that the band itself is cannibalizing one of the death metal genre’s most celebrated formative acts, the very act that its visually arresting cover artwork depicts its characters doing. Gruesome is the closest the scene will ever come to having a new Death album. Obviously “Savage Land” and its songs can’t truly compete with the writing of Schuldiner himself, but as a loving tribute to the original Florida death metal sound the record is close to perfection in about every aspect. It will be fascinating to see how Gruesome progress from here as they could either further explore the band’s crude past (“Scream Bloody Gore” and the even earlier demos as Mantas), or the more technically refined era that “Human” introduced. Either way Gruesome takes its music, it certainly will be one of the most loving tributes to one of the genre’s most visionary musicians.